Twitter is an essential tool for journalists - not only to broadcast their stories, but more importantly, to network with different communities and source stories from the variety of people on the platform. It's important, then, to have a healthy presence on social media. But this isn't easy to achieve. More often than not you just contribute to all the noise already out there, and it's hard to carve out a space where you can share content with an engaged community. You may remember my previous post on my online presence and the challenges. Well, I'm pleased to report some progress on this - but I'll come back to this at the end of this post. For now, let's talk about Twitter. 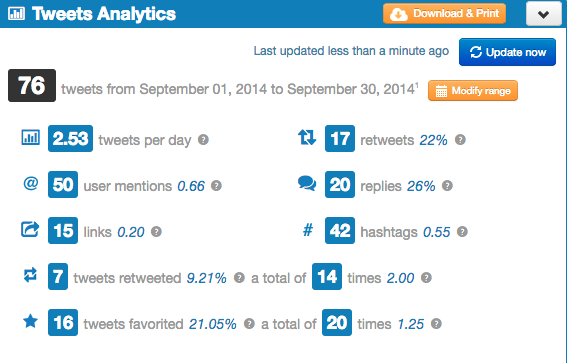 Twitonomy's a handy tool to use for finding out the metrics behind the tweets. Used alongside Twitter's own analytics page, which it is now promoting in-platform, you're able to know what does well with your community and what doesn't. As you can see below, I wasn't a great tweeter in September 2014. I tweeted 2.5 times a day, with a 2.8% engagement rate (the number of clicks, retweets, replies, follows and favourites divided by the total amount of impressions). If it wasn't for tweeting some relatively popular wordclouds I produced on the #indyref hashtag, my impressions would've been even lower than they were. The numbers reflect some bad Twitter behaviour. Pointless sycophantic tweets which didn't add anything to the conversation; sharing content with little thought of adding obvious multimedia content; and breaking news which everyone who's on Twitter has already seen. Sorry, past followers. In all, I produced a lot of noise. I cringe to look back at my half-hearted participation in sports-related hashtags. So I've tried to to do some simple things to increase peoples' engagement in my tweets. I now attach more images to my tweets, and I think carefully about what I actually share. Do the people who follow me want to see this? Are they bothered? Should I be sharing this at all? I now aim for a personal but relevant tone to my online voice. I share pictures and videos more frequently; the content I share is varied, in theme as well as source; and I always make sure the stuff I'm sharing is relevant to my community. I now tweet 4.68 times a day, earning 35,000 monthly impressions with a 4.9% engagement rate. There you have it. Every number - except the amount of hashtags - has increased. This means my tweets are more personalised for my community, with me only accessing other communities if I have a good reason to. The changes reflect a different behaviour - a behaviour that sits better with the people who I engage with online. My tweets are now reaching twice as many people as they did in September, and more of these people are now engaging with what I share. My tweets must now be a bit more relevant for these people: more interesting; more informative; more entertaining. This forms a better bond between me and my community, as the people who follow me begin to enjoy my relevant tweets. Followers trust me as a person, which is an incredibly valuable attribute. They will be more willing to engage with more of my posts in the future. The numbers are proof, I think, that my social media strategy is starting to work. A few simple measures have helped boost engagement with my tweets, and now more people than ever before are (hopefully) enjoying what I share. As promised, I've come back to one of my exploits over the last few months - tackling the fact that I share my name with an American model who is far more popular than me. In general, my online presence has improved. By improving the SEO of my blog, it has moved up the rankings so it's now fourth to appear on a Google search for my name. On Google's first page for the search of Ashley Kirk, five of the ten results refer to me - whether that's my Guardian or City A.M. author profiles, or my LinkedIn page. There is still the problem that model-Ashley Kirk is more attractive than me. I doubt that will change. But it is a small success story each time one of my pages climbs closer to her. Next stop: getting my Twitter page on the first page of results when people search my name. It is so engaging to look about Twitter Analytics!! Clever ideas and insights! 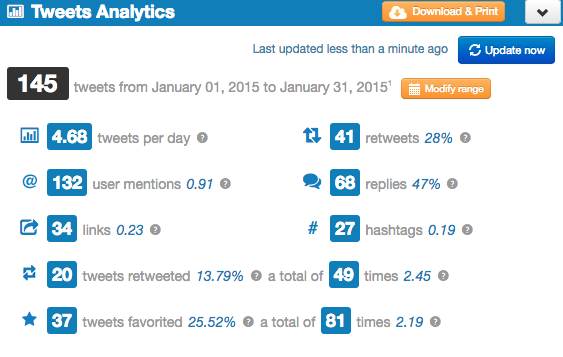 You shared an Interesting information about Twitter analytics and how to use them, thanks for this post. That's great to know about Twitter and I am excited about the how to implement ..great share..